A growing trend in outdoor living means that our patios are treated as outdoor rooms—an extension of our homes. Thriving patio plants are an essential part of how we view our patios: a tropical retreat, a formal entertaining space, or a family-friendly bird and butterfly zone. Whether your patio basks in the sun all day, or functions as a shady retreat surrounded by trees, there is a patio plant that will make your space gorgeous. You may see croton plants (Codiaeum variegatum) in the houseplant section of the garden center, but they make excellent patio plants, and will grow much larger with the sun and rain exposure of the outdoors. 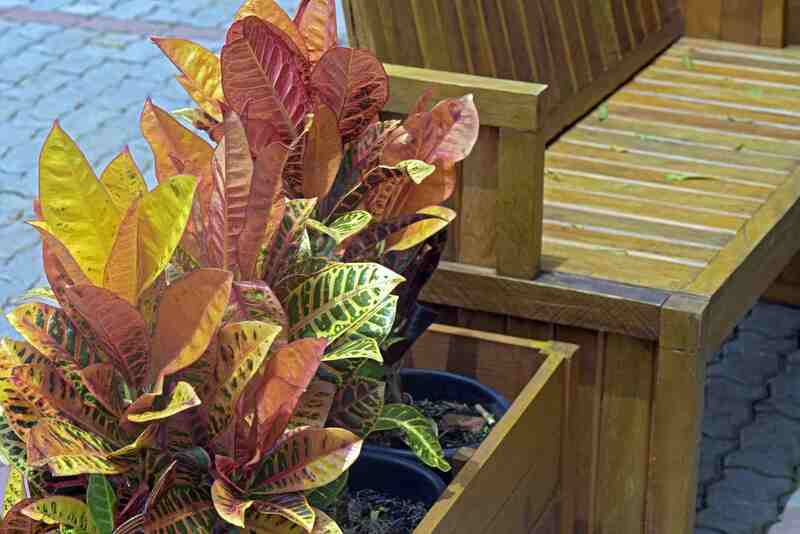 The leathery rainbow-hued leaves thrive in full sun, and only require moderate watering. Few plants have the pollinator appeal of the free-flowering pentas plant (Pentas lanceolata). Cheerful star-shaped flowers bloom in fat clusters of white, pink, lavender, or red all summer long on mounding plants that reach 18 to 24 inches in full sun. Lantana plants (Lantana camara) have suffered a bad rap as being invasive in warm areas, but improved cultivars like 'New Gold' that are fruitless reduce the plant's ability to spread. Plants bloom continuously in warm, sunny weather, and exhibit drought resistance, especially in larger patio containers. Just one reason to love coleus (Plectranthus scutellarioides): the explosion of new cultivars on the market over the past 10 years means there is a leaf color to match every garden design. Grow coleus in sun or shade, but keep it well-watered for best growth. Deadhead lavender flower spikes to keep plants bushy, or leave them to attract hummingbirds to the patio. 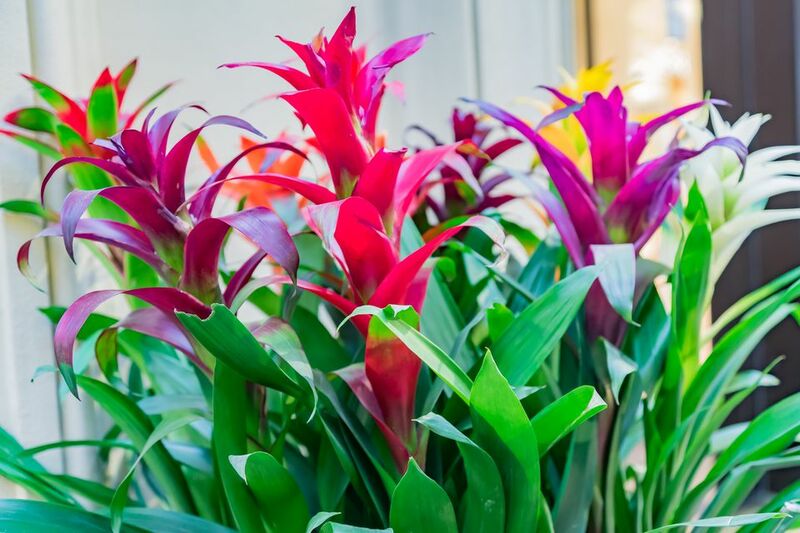 The strappy tropical leaves of the bromeliad (Bromeliaceae) are a fun patio accent, whether or not your plants decide to produce a bloom. Plants usually fade after blooming, but you can make more by repotting the pups that form around the mother plant. Not many patio plants will put on a great show in full shade, but caladiums (Caladium spp.) do so happily. One thing caladiums don't like is cold weather: bulbs will grow slowly or not at all in cool soil, and then spring to life seemingly overnight when summer temps sizzle. Average water needs and a pest-free disposition make caladiums an easy addition to the container garden. Downy mildew disease has turned many gardeners away from impatiens, but New Guinea impatiens (Impatiens hawkeri) are unaffected by this malady. Place containers in a shady part of the patio protected from the afternoon sun, and keep plants moist at all times. What's better, the sweet vanilla scent of heliotrope (Heliotropium), or the showy violet blossom clusters? Grow this Peruvian native in full sun or partial shade, and decide for yourself. Moist, rich soils yield the thriving plants for your patio. Million bells (Calibrachoa) give you all of the showy tubular blooms of petunias, without the bother of the tobacco budworm that often plagues petunia blooms. Unlike petunias, million bells bloom prolifically in high temperatures. Add them to the edge of a patio urn, where they will cascade attractively over the side. From wax begonias (Begonaceae) to more complex tuberous begonias, few plants tolerate such a wide variety of growing conditions. Fleshy stems help patio begonias tolerate drought, and plants are equally happy in sun or shade. Jumbo blooms and neon bright colors make the tropical hibiscus (Hibiscus rosa sinensis) a patio favorite. Just be sure to provide plenty of sunshine and water to keep the bold blossoms coming until fall. The tropical hibiscus is very sensitive to cold temperatures, looking its best in the 70-90 degree F range, and shutting down when temps drop below 50. Move over flowers and foliage, because the brilliant fruits of ornamental peppers (Capsicum anuum) shine as brightly as any blooms on a hot summer day. Ornamental peppers are ready to grow on your patio as soon as the weather is right for growing tomatoes. Although ornamental peppers are small plants with small root balls, they grow well in large pots that don't dry out too quickly. Plant them at the container's edge, in front of a tall spiky plant like purple millet. Foxtail ferns (Asparagus aethiopicus) add a fun sculptural accent to patio containers and hanging baskets, looking like a Medusa-inspired gathering of bright green plumes. Plant in partial shade, and keep constantly moist. Creeping Jenny (Lysimachia nummularia), also known as moneywort, is the perfect patio plant for container edging, ground covers, hanging baskets, or anywhere you want a splash of chartreuse foliage. Plants like constant moisture, and fare better in partial sun than strong afternoon sun, which can bleach the leaves. Also known by zonal or regal geranium, the appearance of pelargoniums (Geraniaceae) in garden centers in late spring seems to set off a planting frenzy that coincides with Mother's Day. If you decide to gift some pelargoniums to mom for her patio, tell her to grow them in full sun, water regularly, and feed monthly. Check out 'Aristo Black Beauty,' with deep purple flowers with a pink picotee edge. Cannas (Cannaceae) command attention wherever they grow, and the taller varieties like 'Giant Durban' make great screening plants for the patio. Cannas are very hungry and thirsty plants, so keep them very moist and feed them with a balanced plant fertilizer to help them reach their potential. An urn full of purple fountain grass (Pennisetum setaceum) waving merrily in the breeze is one of the easiest ways to add instant texture to a bland patio setting. The plants look gorgeous as standalone specimens, but also make handsome partners with trailing plants like the sweet potato vine. Bamboo (Bambusoideae) is a stunning plant that sometimes forgets its manners when it invades the garden with its rapidly growing rhizomes. The solution is to choose small bamboo varieties like Pleioblastus chino 'Variegatus' for container culture on the patio. Use a container at least 18 inches wide and deep, and water frequently. Bamboo likes some shade in the hottest part of the day. If you're craving an evergreen container specimen for the patio, consider the tidy habit of the dwarf Alberta spruce (Picea glauca), which maintains a perfect conical form without trimming or shaping. Plants are hardy to zone 2 in the ground, and may survive the winter in a container in a sheltered area. Long cultivated for its heady fragrance, the Gardenia spp. is a Southern plant, but you can grow it as a patio specimen in full sun or partial shade. Gardenia roots don't like to be disturbed, so choose a large container that will be a longterm home for this plant. Add mulch to keep roots evenly moist, and prune after flowering. No formal patio should be without the elegance a boxwood (Buxus) or two provides. 'Petite Pillar' maintains a tidy shape in containers, while larger cultivars like 'Green Tower' make excellent accent or screening plants.